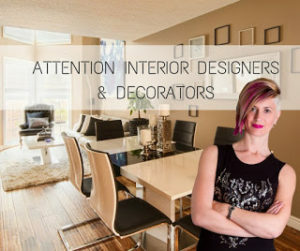 If you work in interior design, you have probably noticed that a number of industry professionals have added home staging to their list of services in the last few years. Home staging can be a great complimentary service to a creative-based service portfolio, but how do you know if it’s right for you? What some may love about home staging, others might see as a deal-breaker and a reason to stick with strictly design. You work with a client’s overall style to create your design plan, based on their specific likes and dislikes. You work with a home’s overall style to create your staging plan, based on the neighbourhood, house characteristics, and buyer demographics. Your aim is to appeal to the largest variety of buyers possible. Projects can take several months to complete. Most projects are completed in less than a month from consult to completion, and in some cases they can be completed in just one week! Be warned – this instant gratification can be addicting. The elements used to create a room are often a large part of the central focus of that room, including all furnishings and statement pieces, as well as the accessories and artwork throughout. Ideally, in home staging, you want to eliminate anything that could be considered a distraction in order to place the focus on the appealing selling features of the house. For this reason, statement pieces are often avoided in favour of more neutral selections. The goal of a project is to provide an attractive and functional space. The goal is to sell the house – therefore you are merchandising the home in order to effectively market it. 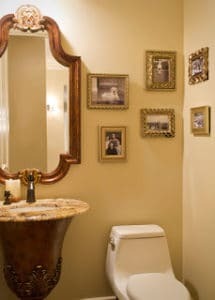 While function should play a role, some comfort of living is often sacrificed to create the best overall look and feel. Personal elements help to create a comfortable home for the owners. Personal items are removed in order to eliminate this potential distraction. Buyers want to envision themselves in the space, and an overly personalized space can make this challenging. Proper furniture placement is critical to a successful plan. 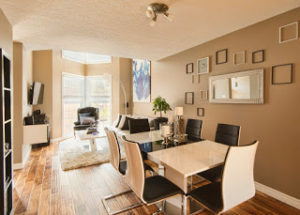 In home staging, standard placement rules apply as they would in design – in fact, in home staging, you’re often outlining for buyers the ideal position of items throughout the space. Room flow is especially important when selling a home. Just as it can affect the comfort of a room for living, improper flow can easily turn off buyers without them even realizing it! The flow of a space can affect buyers on a sub-conscious level, and prevent them from placing an offer on the property. Current trends are applied to both design and home staging plans. In home staging, these trends should be applied in the decorating aspect, and avoided in more permanent elements and fixtures. A well thought out and cohesive plan will always create a warm and inviting space. While there are many stylists that will cross over both industries, and enjoy the challenges that each brings, there are others that prefer to work in their creative niche and comfort zone. The diversity of offering both services can help to keep your designs fresh and fluid! 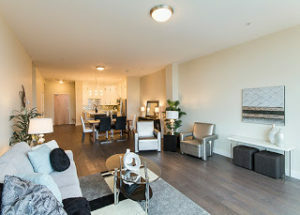 Home Staging is a great complimentary service for design professionals, putting their natural talent to work with a quick turn-around and outcome. Let’s face it – eventually, design clients will sell their house, and that allows designers to easily turn these same clients into home staging clients. Whatever you choose, if you are passionate about what you do, you’ll find your way. Interested in learning more about home staging? Check out Talent vs Training to see what your certification program should provide, and why formal training is critical to success in the home staging world, regardless of a design background.